Feel "nourished" as you are challenged to integrate your mental, creative, and spiritual well being. Develop the wisdom that will help you bend rather than break during life's difficulties. Feel "seduced" with the use of words, poetry, songs, thythms, costumes and instruments... into another world, place, and time. Feel "inspired" as you gain tools to help you explore the joy, deal with the pain, and learn how to mazimize the personal and professional opportunities of daily life. Feel "stimulated" to open your heart to better self-awareness, establish deeper connections with others and learn how to sort the significant from the trivial and move forward on life's stage. 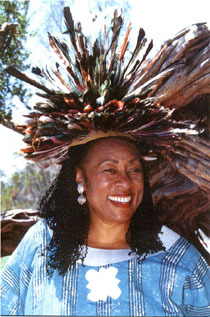 As an Ancestral Storyteller, Certified Psychodramatist and Actor, she has received many major awards. She has worked in both stage and film and is currently host of a cable talk show. Following is a partial list of some theaters where she has performed: The Old Globe, Marquis Public Theatre, Fiesta Dinner Theater, La Jolla Playhouse, and the Lyceum. She is a seasoned professional speaker who has an extensive background in both the corporate and academic arenas. Alyce is equally comfortable setting up motivational training programs or teaching schools and organizations how to deal with diversity, become better listeners and to connect with life. Clients have included: MCI, The Smithsonian Institute, U.S. State Department, FBI, San Diego Convention & Visitors Bureau, THe D.C. Commission for the Humanities, and Mobil Oil. Her credentials include education as a registered nurse (R.N. ), with a specialty in psychiatric nursing, and a master's degree (M.Z.) in Human Behavior. She is a staff Chaplain at Scripps Memorial Hospital, an Ordained Minister and is in private practice as a Spiritual Counselor. Hear her new storytelling CD! 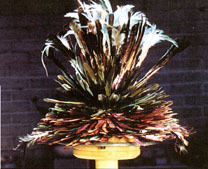 The headdress was handmade in the Cameroons, West Africa, for the exclusive use of the Tribal Elders, Healers and Storytellers.